You should always go to an exhibition with your objectives in mind. Unless you’re selling products there and them, winning new business is more of a long-term goal that’s hard to measure after one exhibition. How about creating an objective that’s simply to make new connections. This could of course be with potential clients, but could also be with potential suppliers and like-minded people. You never know where these new connections may take you, so don’t dismiss anyone just because you don’t think it’s not going to convert to a sale. It’s not easy to talk to strangers all day and this can be a daunting prospect for some people, but even the quietest members of the team can really thrive when partnered with their ‘louder’ colleagues. Discuss with your teams, together or individually, and provide any support or coaching they may need beforehand. Freebies and giveaways are always a draw, but there are only so many pens and packets of Haribo that you can hold (although we never say no to Haribo). Make sure your stand stands loud and proud with a great design and include something that can start a conversation. 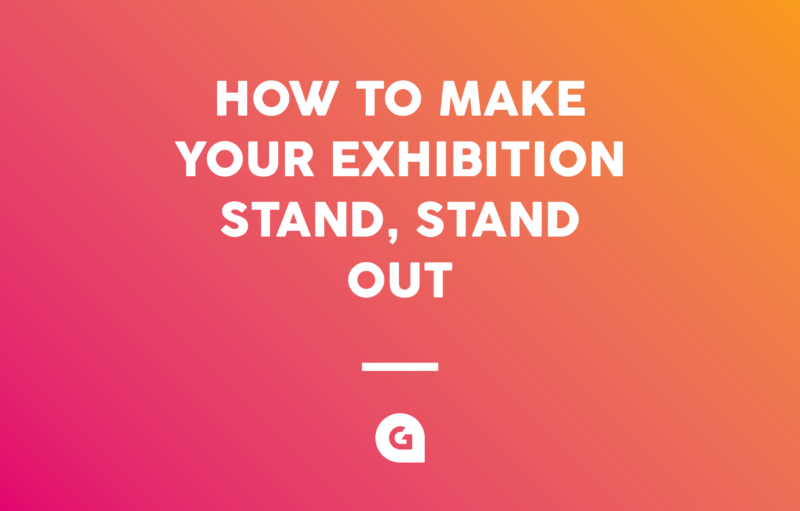 Whether that’s a coveted prize, a stand-out project that you want to talk about, or simply conveying your brand personality in the stand itself. You want people to stop to come and talk to you. There’s nothing worse than getting to an exhibition and realising you have no idea how to put up a stand, or that a part is missing. Book some time in, a week or so before the event, to put the entire stand together and make sure everything’s good to go on the day. Hot tip:It’s always worth practising your elevator speech before an event too – can you summarise what your company offers within just a couple of minutes? Get it right and it’ll roll right off the tongue on the day. If you’re having fun, it’ll show. There’s nothing more off-putting than a miserable-looking stall holder. Everyone’s in the same boat at these events so chat to your fellow exhibitors, to the organisers, be yourself* and do your company proud. *We’ve found this may require a caveat if any of your staff members are prone to belting out a Cher impression unannounced. We won’t mention which Glow staff member this is, but feel free to have a guess! We’re always happy to help with the design of your exhibition stand and materials, from Pop-Up banners, Roller Banners, Exhibition Panels, Exhibition Materials, to Brochures, Merchandise, and Livery. If you need some ideas or advice, just get in touch.